Nic bought Angela's engagement ring 2 years ago from a High Street Jeweller. After experiencing 3 separate faults, they took advice from a good friend; demanded their money back and came to see us. Nic and Angela were obviously very disappointed when their original ring developed 3 separate faults. Thankfully a good (we think great) friend pointed them in our direction and we were able to guide them through the process of creating their own perfect ring. Step 1: Choosing their Perfect setting. After browsing our website, Nic and Angela came in to our Hatton Garden showroom and tried on several styles until they found "The One". 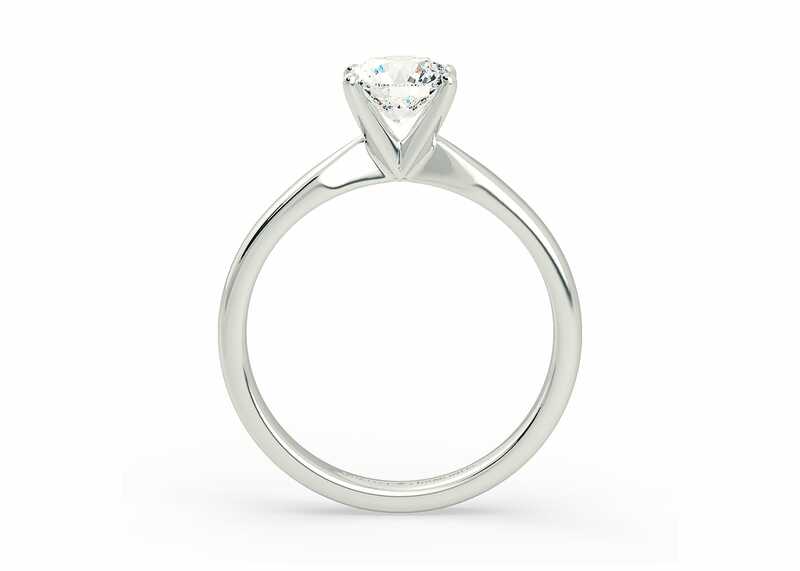 They selected our Classic Solitaire Amia. Inspired by the French word for Beloved, the Tiffany style Amia features four delicate claws and open detailing around the band which allows light to flood through the diamond maximising sparkle and brilliance. Our philosophy has always been driven by providing the very best quality diamonds for our clients' budget. There are so many factors that can impact on price that truly understanding a diamond's characteristics is key to matching a couple with their perfect diamond. So, when Nic and Angela came to visit us Paul shared his knowledge and helped them identify which characteristics they wanted to prioritise. They picked a wonderfully sparkly 0.70ct Round Brilliant diamond. Nic very kindly left a wonderful review on TrustPilot.Trustpilot is an open, community-based platform for sharing real reviews of shopping experiences online. It is an excellent source of independent reviews and we hope it helps new customers to buy with confidence. Do not go to a high street jeweller! After 3 x separate faults over 2 years with a Beaverbrooks diamond engagement ring, we decided enough was enough and got a refund. I was referred to Paul at Quality Diamonds by a friend and we started to talk. Long version-short is that my fiancee and I met Paul and the experience was great. We felt very much a part of the whole process - first narrowing down ring style from dozens to the chosen one and also (once being educated in plain English by Paul all about diamond size, clarity, weight and much much more) the diamond itself from a choice of literally 1000's. The service was first class, Paul was an absolute gent and the ring is just amazing. A bonus too that the insurance valuation is twice what we paid! Cannot recommend these guys highly enough, get down to see them and don't ever go to a high street jeweller again.